It isn't often that I find clothes that are remotely vintage at op-shops, these days, but I quite fortuitously found a lovely 70s/80s pink dress whilst out last week. Fortuitous because I'd been longing for something a little late '70s and for more pink in my wardrobe! If I'd paid attention to the measurements on the tag I would have let this stay there thinking it was about three or four sizes too small for me. Well, it fits really well! I'm going to replace the buttons as I'm not too keen on pearly buttons. Plus I think they're a wee bit small. I don't think these are very old, from the feel of the plastic, but the design is quite mid-century. And I got to pick up a Barbie set I've been anxiously waiting for for months now, today. 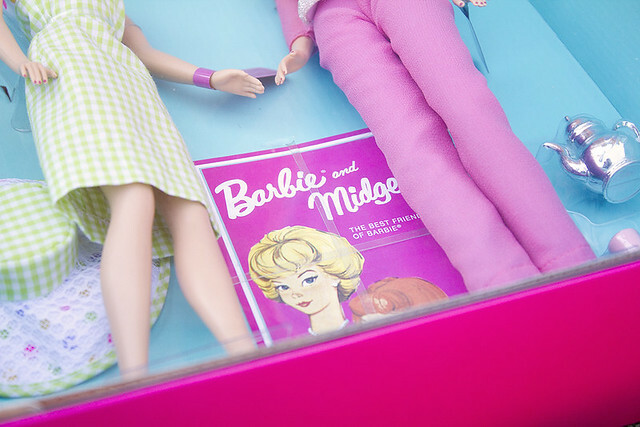 Midge is my favourite of Barbie's friends/family (OK, close draw with Francie) so I'm excited she's getting a bit of attention for her 50th birthday this year. The bag is super cute!Love the design on the canisters too! 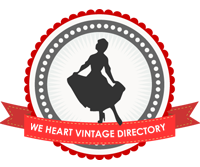 Ooohh, what delightfully fun finds! Love the vivid pink popsicle hue of that great dress. Completely agree, new buttons are in order, those ones seem a trifle too small and delicate for such a bold colour. Great finds Andi! The dress is gorgeous and you are so right about not paying attention to the measurements on 70s dress labels. They're never the same by today's standards. Going from the shot you've posted I think your bag may be 60s? I love it when that happens! You found some cute things. The bag could be 60s or a 1980s throwback.